Grandpas are some of our greatest teachers and dearest friends. They are there for us through thick and thin. 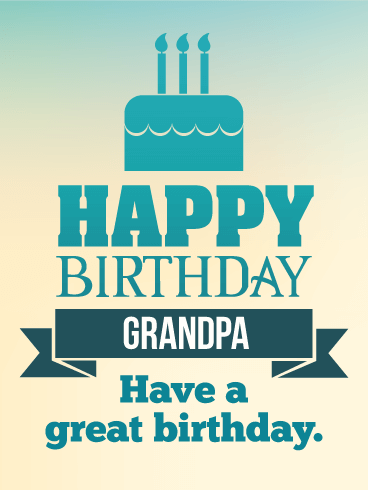 Send a sweet birthday message to your grandpa with this thoughtful birthday card. Let your grandpa know it doesn't matter what you do together, it's always a good time! 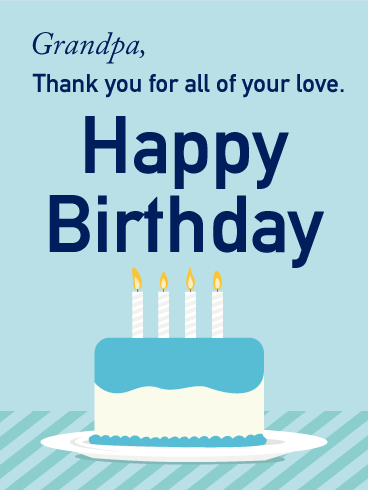 Your grandpa's birthday will be even better with a cheerful birthday card waiting in his inbox! It's easy to send love across the miles to a grandpa so deserving of a little extra affection from his favorite grandchild. Happy Birthday to my grandpa - From fly fishing to chess, from books to baseball games, it doesn't matter what we do- it's always the best time when I'm with you. I love you, grandpa! Simple and sweet. Take the time to send your dear grandpa a heartwarming birthday message. 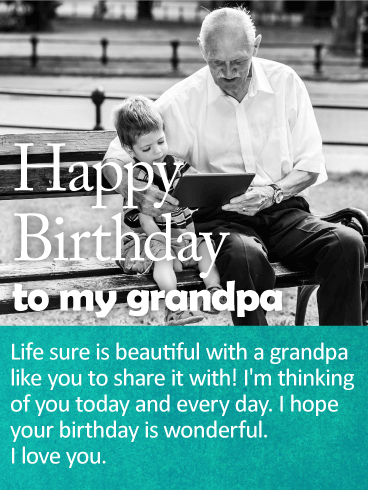 This lovely birthday card is a simple way to send warm wishes to your grandpa on his birthday. Wish your grandpa a day filled with love and happiness. When you send a birthday card to your grandpa, you're really sending a smile! Brilliant and clever. The times spent with grandpa are like nothing else. Grandpas are full of quiet wisdom and clever fun. They know how to tease and how to teach, all while making sure you feel loved and cherished. Wish your grandpa a very happy birthday with this beautiful birthday message. Our birthday cards are fast and easy to send. If your grandpa enjoys the finer things in life, this birthday card is just perfect. A good whisky or scotch on the rocks represents a life full of flavor and steeped in goodness. Raise a glass in honor of your grandpa's birth and toast his health and happiness this coming year. This unique and refined birthday card will be perfect for your grandfather. If you can't be there in person, you can be there in spirit. Send a thoughtful birthday card to celebrate your grandpa's birthday. 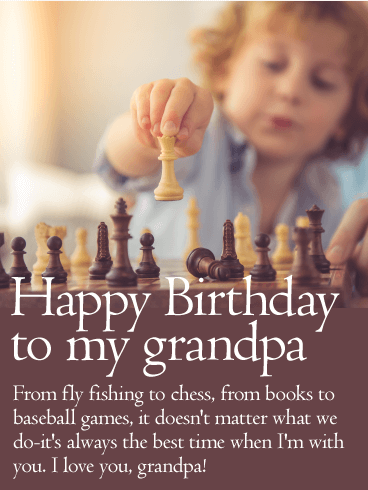 Offer this stylish birthday card to your amazing grandpa! 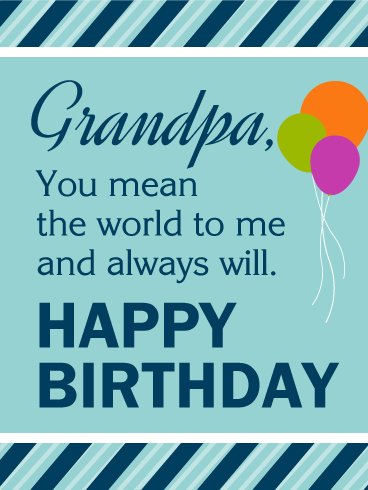 The simple yet effective design and the sweet message will cheer up your grandpa's special day! Wait no more, get him this classy birthday card today! Grandpas and granddaughters are a winning combination. 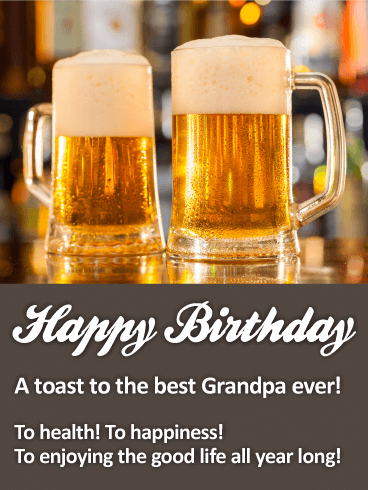 Wish your sweet grandpa a happy birthday with a special birthday card. Grandpas don't ask for tokens of love. They keep on loving no matter what. That's why it's so important to send a heartfelt birthday message on your grandpa's birthday. It might be one of the few times a year you can tell your grandpa just how terrific he is to you and how lucky you feel to have him in your life! This chic birthday card for your dear grandfather is the perfect little gift to put a smile on his face. 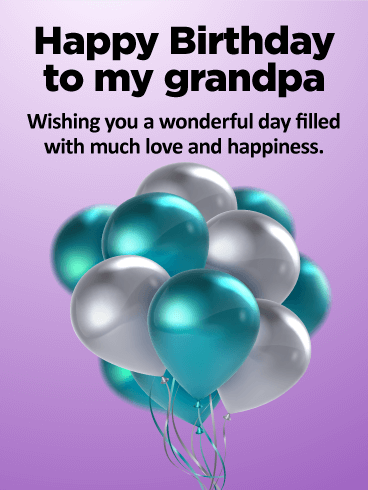 Your grandpa is one of the most special members of your family, make sure to lighten up his day with this birthday card. Get him this elegant yet cheerful birthday card today! 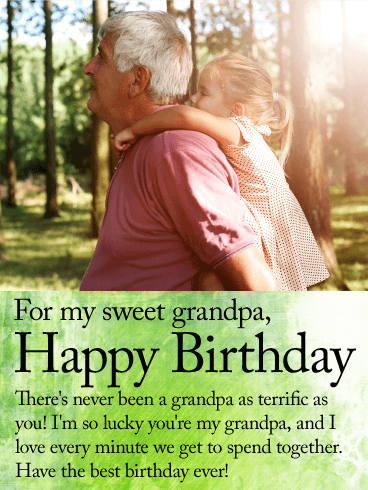 The perfect birthday card for grandpa is sentimental, sweet, and sincere. This thoughtful birthday card is made　especially for a grandpa dear to your heart. Remind your grandpa how much you love him and need him in your life with this heartfelt birthday message and card. It will brighten his day and lift his spirits. This colorful birthday card will quickly put your grandfather in a celebration mood! Make his special day even more special with this card filled with balloons. 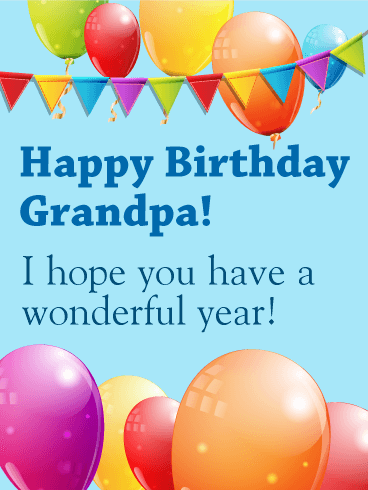 Offer your grandpa your sweet message for a wonderful year in this joyful birthday card! Wish a very happy birthday to your sweet grandpa. Send your grandpa a birthday card and watch his face light up in a smile. Whether near or far, it's easy to reach out to loved ones with a special birthday card. 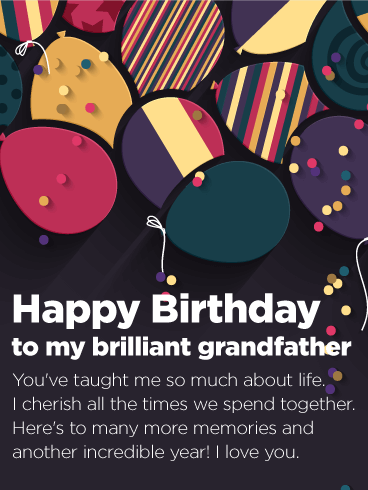 Reflect on all the good times you and your grandpa have shared, and send him a thoughtful birthday card to let him know how much it means to have him in your life. A modern and stylish birthday card, perfect for your dear grandfather. 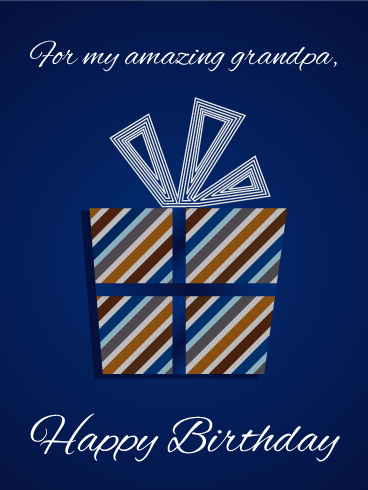 This card will cheer up his birthday, especially with the wish coming from you! Get your grandpa this classy birthday card and watch him smile with joy! A celebratory birthday card that speaks of all the love you have for your dear grandfather. The festive style will appeal to your grandpa and the message will make his heart melt. 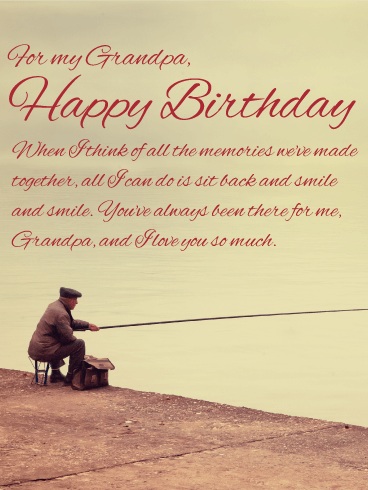 Celebrate your grandfather's special day and offer him this birthday card today! A toast to health, happiness, and the good life! Raise a pint in cheer for your grandpa. Send your grandpa this awesome birthday card and make his day. It doesn't take a lot to make your grandpa happy. He'll love your thoughtfulness on his birthday. 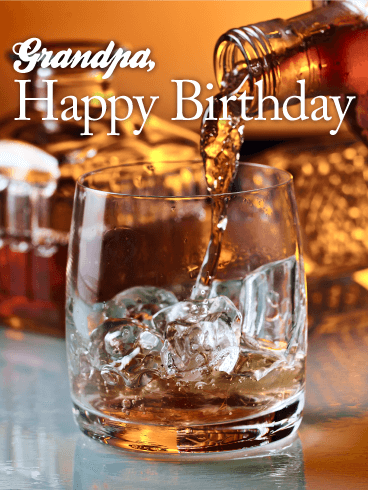 Wish him a happy birthday and toast his happiness with this perfect birthday brew card.